The “Shopify of China” could be a better growth play than Shopify itself. Baozun (NASDAQ:BZUN) is often called the "Shopify (NYSE:SHOP) of China," since both companies bring smaller retailers online with digital storefronts, marketing campaigns, and fulfillment services. Both stocks have also rallied nearly 130% this year. Baozun and Shopify might seem superficially similar, but I believe that the former is a much better growth play than the latter for five simple reasons. China has an internet penetration rate of 52%, compared to an 89% penetration rate in the US. China also has a rapidly growing middle class, with 76% of its urban population set to reach that status by 2022 according to McKinsey & Company. China's e-commerce sales could top $1.13 trillion this year according to eMarketer. That makes it the biggest e-commerce market in the world. For comparison, the US market is expected to generate $451 billion in e-commerce revenues this year. The firm also estimates that e-commerce sales will account for 23.1% of all retail sales in China this year, but that figure will jump to 40.8% by 2021. Baozun is well-poised to profit from that growth, but Canada-based Shopify mainly serves the US market. Baozun's biggest stakeholder is Alibaba (NYSE:BABA), which owns nearly a fifth of the company through its investment unit. That support widens Baozun's moat against any potential competitors, integrates its platform into Alibaba's Tmall and Taobao marketplaces, and nullifies the notion that Alibaba would launch its own Baozun-like platform. Shopify previously faced a similar threat from Amazon (NASDAQ:AMZN), which launched its competing WebStore service in 2010. Amazon eventually killed the service five years later and partnered with Shopify to integrate its tools into its marketplace, but it didn't buy a big stake in the company as Alibaba did with Baozun. Analysts expect Shopify's revenue to rise 70% this year, compared to "just" 20% growth for Baozun. However, Shopify's biggest weakness is its lack of profitability. Shopify posted a slim adjusted (non-GAAP) profit of $5 million last quarter, and analysts think it might squeeze out a full-year profit this year. But on a GAAP basis, Shopify's bottom line remains deep in the red, partly due to rising stock-based compensation expenses. Baozun is profitable by both non-GAAP and GAAP measures. Its non-GAAP net income rose 25% annually to $35.1 million yuan ($5.3 million) last quarter, while its GAAP net income grew 12% to 21.9 million yuan ($3.3 million). That's because Baozun exercises much better control over its operating expenses, as seen in the following chart. Shopify doesn't have a trailing P/E due to its lack of profits. But it trades at 19 times sales and 403 times next year's earnings -- assuming that it can achieve profitability. Baozun trades at 86 times last year's earnings, 25 times next year's earnings, and has a trailing price-to-sales ratio of 3. Nobody will mistake Baozun for a bargain stock, but it's trading at much more reasonable valuations than Shopify. Another major problem for Shopify is that it's being targeted by prolific short seller Citron Research, which claims that the company "oversells" the ability of its platform to generate revenue, that many of its small customers can't grow into sustainable businesses, and that it was selling its business as a "get-rich-quick scheme." Baozun isn't being hit by similar claims. Therefore, investors who were originally considering buying Shopify might consider buying Baozun instead. I like Shopify and Baozun's business models, but I think Baozun is the better growth play at current prices. 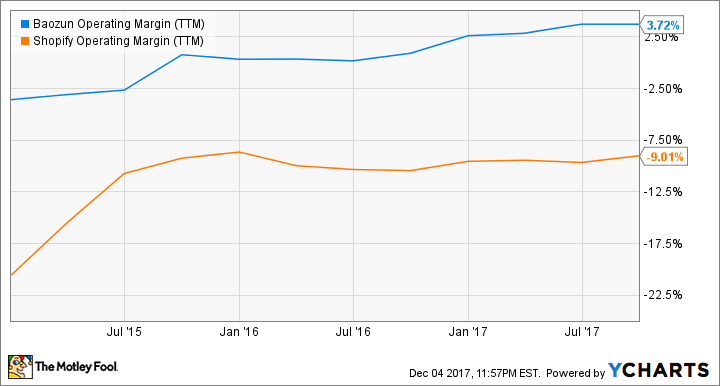 Its top-line growth isn't as impressive as Shopify's, but it has higher margins, better earnings growth, lower valuations, and a bigger market in China. Shopify isn't a bad investment, but I'd wait for a much lower price before pulling the trigger.